After the success of the first kit (Premier Elite Concert Toms) I restored for The Book of Genesis gigs, I seriously wondered if I could go through the hassle of building a second vintage kit! Although, after a couple of weeks of playing the first one, I decided to pursue the idea of the double headed Premier Soundwave. This was the first kit I ever saw Phil play live with Genesis (Duke Tour 1981 Hammersmith Odeon). 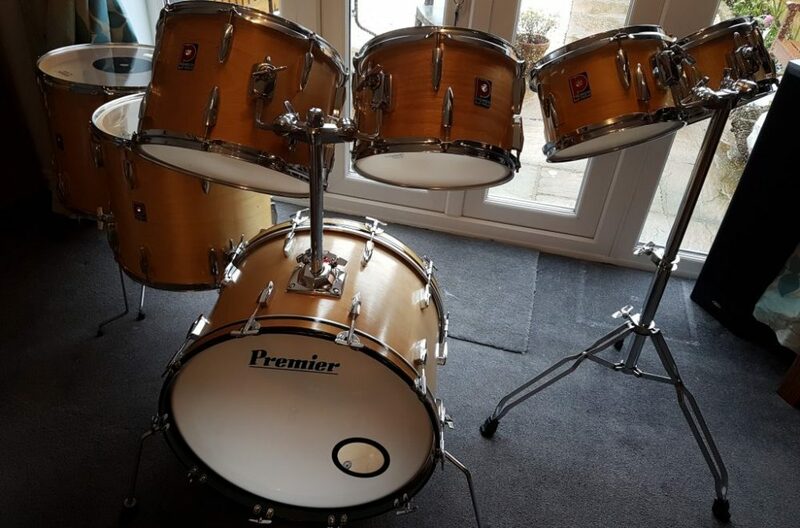 It was a kit I always fancied owning a replica of, since the Premier poster of it used to take pride of place on my bedroom wall when I was a 15 year old drumming hopeful! We also had the prospect of some double drumming gigs coming up for The Book of Genesis. Phildas my predecessor was going to be flying over from Switzerland to rehearse the drum duet and for us to film it. In June we had two important gigs in which to unveil this – Charterhouse and Salisbury – it seemed worthwhile to put the work in on the second kit so we could both be playing Collins replica instruments. However, time was tight…..and there was a lot to do! As ever, it takes a lot of research, painstaking hours trawling eBay and other Vintage drum avenues to piece together a recreation of an icon of rock history like this. 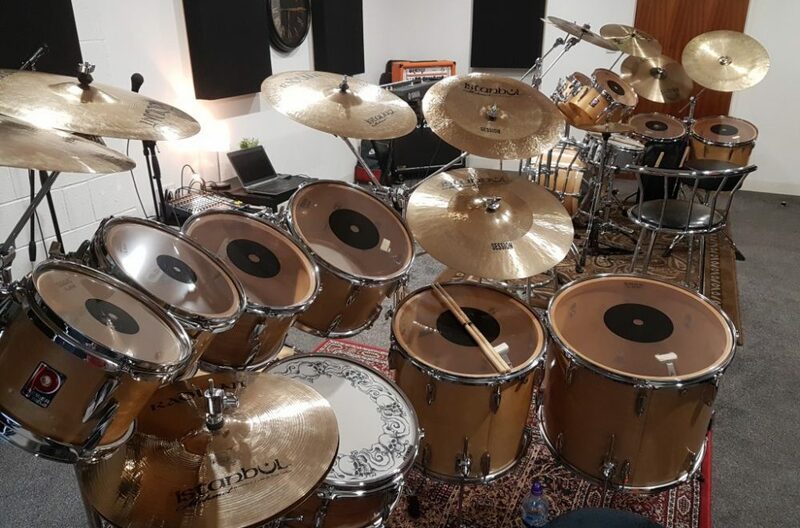 The chance of finding a complete kit in playable condition is highly unlikely (not to mention prohibitively expensive), since we are talking about an instrument approaching 40 years of age. 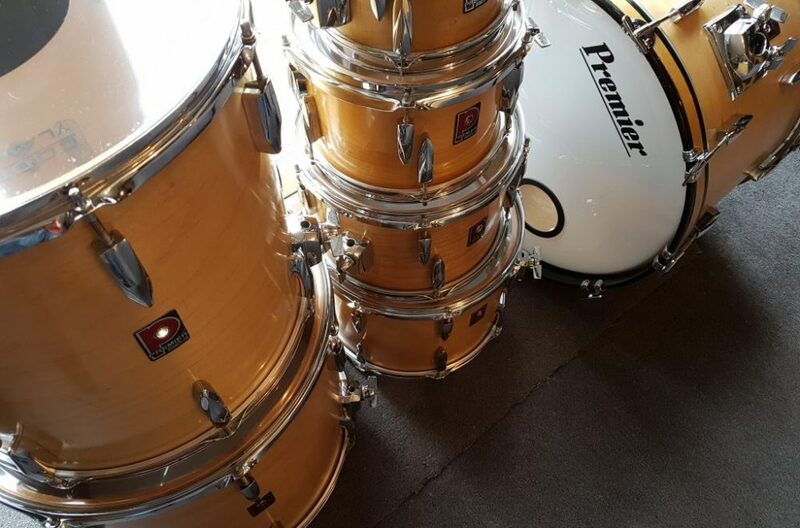 Anybody seen the price of vintage Gretsch & Ludwig drums?, Premier kits (being an English brand) are still readily available and by comparison to the American Marques, are relatively affordable to those of us living in the UK. So, I decided to adopt the same approach as the previous kit, and to put this one together out of “orphan” drums and shells. I had a double headed Elite 16” floor tom left over from the previous kit, which I decided to use for this project. It would require different hoops, tuning rods, lugs and an 80’s Premier badge, but essentially the birch shell was the same as the later Soundwaves. Remember these in the photo? The drum in the top left is the floor tom I mentioned above, and the first part of the new kit. 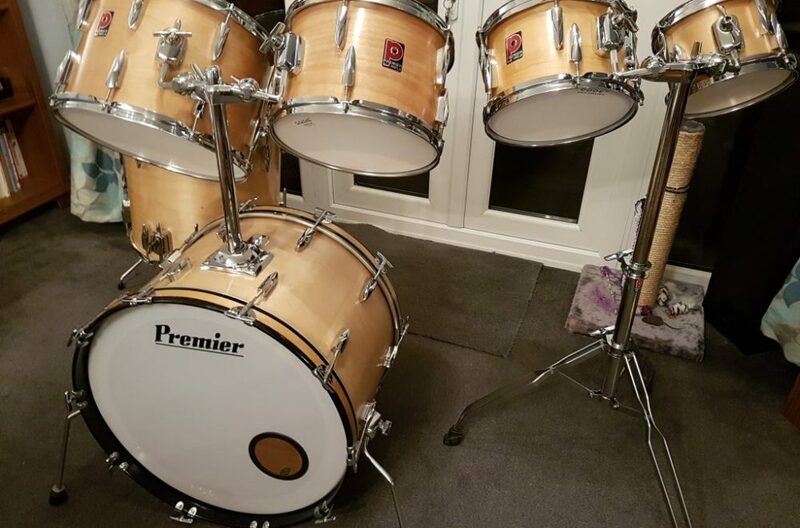 The next addition came courtesy of scouring Gumtree – a Soundwave bass drum shell. These are rare, and meant a trip to North London to retrieve it. Sounds like a good start on the face of it, but in truth the shell is one of the easier parts to find in comparison to some of the rare hardware components. Now I needed hoops (more about them later) tuning rods (T’s) & claws, lugs, spurs and a tom holder. Ebay produced the lugs, pretty easily I must say – and the T’s & Claws were raided from another Soundwave kit which turned up again on Gumtree – not so easy this one, as it was in Sutton Coldfield! 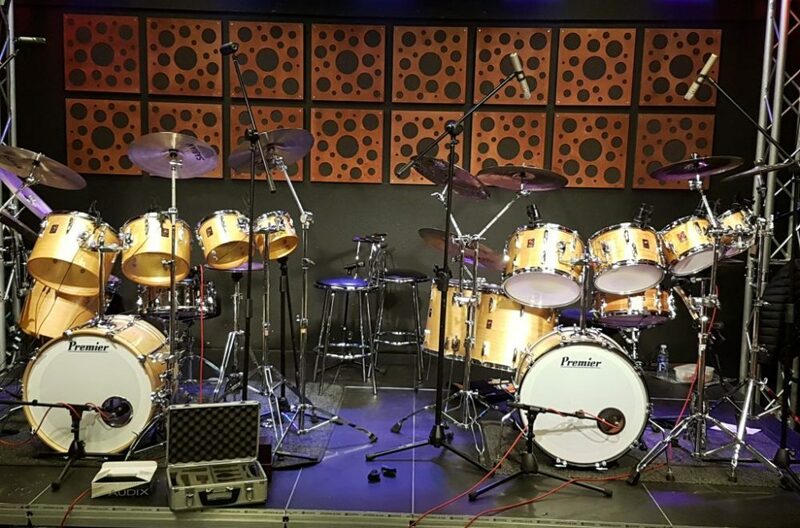 At this stage I had so many drums in pieces, I just had to take stock….. I realised after a rummage through my flight cases I did actually have a suitable 8” tom shell, which was unused from the previous kit, I also realised three of the shells destined for this project were simply not the right colour birch and the wrong type of shell (no reinforcement rings). 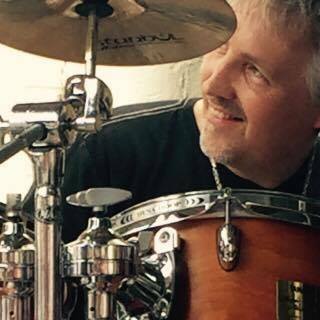 So the search began…… I had access to another Elite floor tom, this time an 18” through Tristan Head at Drumattic. He was the restorer who worked on the first kit and for some reason agreed to do this one too. So, the illusive drums at this stage were three hanging toms – 10”, 12” & 14”. The search for the 14” Soundwave tom was relatively pain free, as a red one showed up on eBay quite quickly – although the metalwork was in poor condition, and would need renovation (or probably replacements). In the meantime, Tristan at Drumattic was doing well with the bass drum – he’d found in stock everything we needed, except the bass drum hoops – which he duly ordered. We went with a brand new repro set of birch hoops, as the originals are very difficult to come by in natural wood. However this was to come back and bite us later on, when it was discovered the bass drum shells of this era were a non standard size. Full gory details in the final build section! One of the features of this custom kit of Phil’s was that he essentially asked Premier to “double head” a concert tom kit for him. This means the smaller toms (particularly 8”, 10” & 12”) were too shallow to fit two lugs “in line” as is common on modern double headed drums kits. This was possible on the 14” drum, (clearly visible on the second picture in this article) but the three small drums required “staggered lugs” due to their reduced depth. This is an important feature of the kit, as many of you will know that Phil plays his smaller toms above the hi-hat. Deeper drums would make correct placement for his kit configuration very difficult and effectively too high. Anyway, at this stage Tristan started to experiment with lug placement on the two smaller drums – I had a low end Premier Crown 10” tom shell, which we tried out to get the “look” first of all. The 8” shell was the one we were going to use, so that was done second. The larger Crown tom is way too dark to be used in the final kit, plus it has the wrong lugs as you can see from the photo below with both drums present. 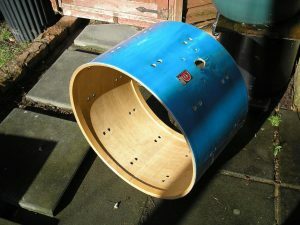 Also below is a picture of the bass drum shell from Gumtree, before being stripped back to the wood. At this point due to the trials and tribulations faced to recreate the 10” tom (plus at this stage no 12” drum had been found) I should mention my fellow “Phil Collins Geek” from Germany, Daniel Schwarz. Some of you may be aware of the fantastic Canadian Genesis Tribute band “The Musical Box” – Daniel played with them when he was only 16 years old, and is a self-confessed Collins nut. The phrase I attribute to Daniel that stayed with me when we first spoke (via the Premier Percussion Facebook Group) was “Collins is one of my hobbies” – hmm, mine too – but this guy is way more obsessive than me! 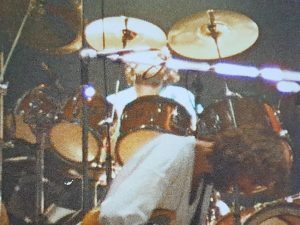 Anyway, for this reason Daniel has been a source of many snippets of information I didn’t know about Phil and his kits. On top of that Daniel also happened to have some “reject” shells from his own Collins replica kit, which is still a work in progress. The 10” (almost completely restored and lacquered) & the 12” shell (in need of some work) – actually had to come all the way from Germany. These were really the final piece of the jigsaw puzzle, so I’m very grateful to Daniel for his help and of course his encyclopaedic knowledge of Phil Collins’ kits! So, we now have all the shells, some of the hardware and around a month to go for when we are filming the two kits together – this was always going to be a challenge! So, what else did we need in order to complete this crazy project? As mentioned above, Daniel Schwarz literally saved the day with the 10” & 12” shells, he also sent me two hoops (one for each drum) which allowed me to complete these two as double headed. I had all the lugs needed now, via eBay and the Premier Facebook Group, so as soon as Tristan had these shells drilled and the 12” refinished I could build them. In the meantime I’d put together a shopping list- we were short of lugs and hoops for the 14” tom, as my best efforts to remove corrosion with Autosol car chrome polish did not make a difference to years of neglect. We were also short of internal dampers, a very authentic addition to Premier drums. Tom mounting blocks were another important spare item I had fallen short of – I had loads, but only a couple were in good enough condition for this restoration job. So this was all adding up, and the budget was running low! Fortunately Tristan is very much a supporter of recycling in the Vintage Drum world, so were able to swap some of my no longer needed parts for things I did need. The trouble with building these sorts of kits is that you accumulate literally boxes of spare parts – and sometimes you take a chance on “job lots” to get that illusive component. Some of that had to go in order to keep the finances on track and get this project finished! 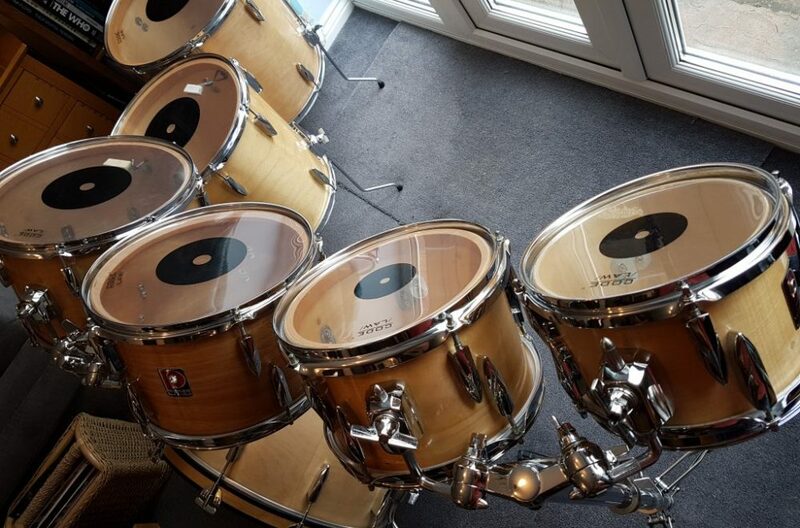 Back to the bass drum hoops…… Having collected the 8” & 14” shells ready for building, I also collected the newly lacquered wooden bass drum hoops. 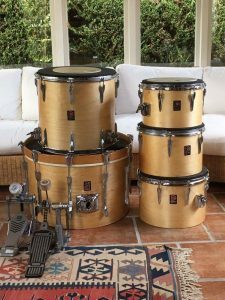 This is when the business of restoring vintage drums becomes highly frustrating – the new hoops were at least half an inch too big, placing a massive strain on the tuning rods and lugs! Both of these components are not only difficult to find, they are 40+ years old and need to be looked after – not put under strain. So, here we go again – I had to raid some hoops off another Premier kit destined for restoration, and these ones fitted! Phase two of the kit build will include the addition of the right hoops, which Tristan is working on as I type this. So the Achilles heel of this build turned out to be an odd sized bass drum, just like the first kit suffered with an odd sized “pre-International” 10” tom! A week later I was collecting the remainder of the kit from Drumattic – with two days to spare! 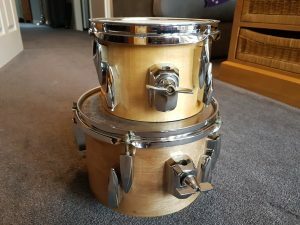 Tristan had finished the floor toms and had fitted the correct lugs, badges and hoops, and refinished the 18” which was a polychromatic red one, originally. Yes! I’m so happy you did this. I’d love to get behind both kits. My kit is a similar configuration to the Duke kit you build, but it is in white. I’m looking to get an 8″ tom to replace my 14″ so I’ll have an 8″ 10″ 12″ 13″ 14″ 16″ rather than two 14″ toms. With a kit like that PLEASE post some videos on both kits on youtube so I can hear! Thank you for doing these projects! !